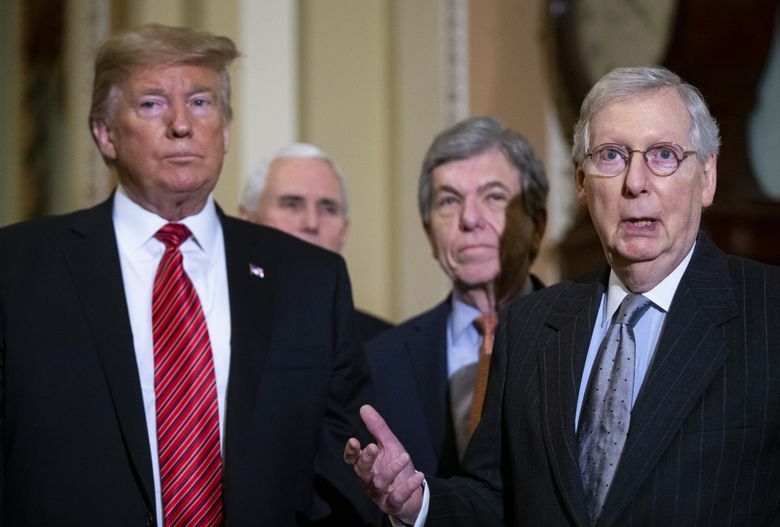 Senate Majority Leader Mitch McConnell, R-Ky., right, and President Donald Trump at the U.S. Capitol in Washington, D.C., on Jan. 9, 2019. (Bloomberg photo by Al Drago). WASHINGTON – Public disapproval of President Donald Trump has swelled five points to 58 percent over three months as a majority of Americans continue to hold him and congressional Republicans most responsible for the partial federal government shutdown, according to a new Washington Post-ABC News poll. 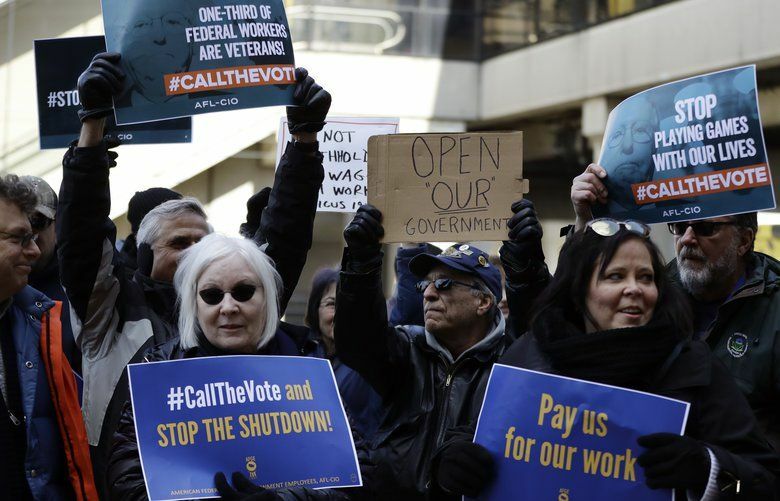 In addition, more than 1 in 5 Americans say they have been personally inconvenienced by the record-long shutdown, which reached the five-week mark Friday amid reports of turmoil at airports, slowdowns at the Internal Revenue Service and growing public pain as 800,000 federal workers, and many government contractors, go without pay. Congressional leaders were scrambling Friday to break the impasse after a pair of legislative bills to reopen the government were defeated in the Senate a day earlier. One was a White House-backed proposal that would have offered temporary deportation protections for about 1 million immigrants in exchange for $5.7 billion in wall funding and changes to asylum laws. On Thursday, Trump signaled he would support a short-term continuing resolution to reopen the government but his insistence on a “down payment” for the wall to be included was promptly rejected by Democrats. For Trump, the public disapproval of his handling of the shutdown illustrated the political risk he faces as he continues to fight to please his conservative base by building a wall along the U.S.-Mexico border, his top campaign promise. The Post-ABC poll finds that Trump’s overall popularity has weakened, with 37 percent of the public approving of his job performance and 58 percent disapproving. That compares to a narrower 40 percent-53 percent approval-disapproval margin in the previous Post-ABC poll just before November’s midterm elections in which Democrats won control of the House of Representatives. Though the new survey finds that a 54 percent majority of Americans disapprove of House Speaker Nancy Pelosi’s performance during the shutdown, negative ratings for Trump on this question are higher at 60 percent. And when asked who is most responsible, 53 percent blame Trump and congressional Republicans while 34 percent blame Pelosi, D-Calif., and Democrats. The 19-point margin of blame is slightly smaller than 24 points a Post-ABC poll roughly two weeks ago. Among political independents, disapproval of Trump has grown from 53 percent at the start of November to 63 percent. Independents have also had a lopsided reaction to the shutdown, with 54 percent saying Trump and Republicans are more responsible for it while 29 percent blame Pelosi and Democrats, a 25-point margin, slightly wider than the public as a whole. White House aides have expressed concerns in private about Trump’s strategy, fearful that the deepening public impact of the shutdown could prove a long-term drag on his political fortunes as the president begins to focus on his 2020 reelection campaign. But the president believes his fight for a portion of his wall will resonate deeply with his base, and he has been buoyed by support of influential conservatives in Congress and media personalities. Trump also faces mounting political pressure on other fronts. On Friday, the FBI arrested his longtime associate and informal adviser, Roger Stone, in connection with Special Counsel Robert Mueller’s ongoing investigation into Russian interference in the 2016 election. Trump has repeatedly warned of a national security and humanitarian crises at the border, fanning public fears by inflating the dangers posed by undocumented immigrants. Aides said Trump remains hopeful for a negotiated solution, but he has asserted he retains the legal right to declare a national emergency at the border, which would potentially allow him to redirect billions of dollars from the Pentagon to fund a border wall project. During his campaign and after he took office, Trump repeatedly vowed that Mexico would pay for the wall. On Friday, the Trump administration launched a new program aimed at forcing migrants seeking asylum at the southern border to wait in Mexico as their immigration court hearings are adjudicated. That process that could take months, or even years, due to huge backlogs that have been made worse during the shutdown because immigration judges have been furloughed. The new procedures, which have been called unlawful by immigrant rights groups, mark the administration’s latest response to a surge of immigrant families from Central America over the last five years – a phenomenon that Trump aides privately acknowledge would not be adequately addressed by a border wall. A record 107,000 family members were apprehended at the border in fiscal 2018 – and most surrender to authorities in hopes of winning asylum. Polls have consistently showed that a majority of Americans do not support the wall. The Post-ABC News poll finds that 54 percent oppose the project, with 42 percent supporting it, matching the results of a Post-ABC poll two weeks ago. A separate question suggests majority support for increased border security efforts in general, with 54 percent saying the U.S. is doing “too little” to keep undocumented immigrants from coming into the country. Democratic leaders, including Pelosi, have called the wall “immoral.” They initially offered Trump $1.3 billion in additional border security resources that would not include a barrier – the same amount of funding DHS received for border security in fiscal 2018. Democrats have proposed raising that amount as long as the money does not go toward a wall. Asked who they trust more to handle border security, 42 percent say they trust Pelosi and Democrats in Congress while 40 percent trust Trump and Republicans. By comparison, a fall Post-ABC poll found Republicans overall held a 10-point advantage over Democrats in trust to handle border security among registered voters. The Post-ABC poll was conducted by telephone Jan. 21-24, 2019, among a random national sample of 1,001 adults, with 65 percent reached on cellphones and 35 percent on landlines. Overall results have a 3.5 percentage point margin of sampling error for the full sample. The Washington Post’s Emily Guskin contributed to this report.